TANDEM, the 2nd album of pianist Marie-Andrée Ostiguy, was nominated for a FÉLIX and a JUNO in 1995. 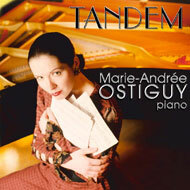 TANDEM includes 14 original compositions by Marie-Andrée Ostiguy, representing 50 minutes of instrumental piano music. Performed and produced by Marie-Andrée Ostiguy and Don MacLean, the arrangements and musical direction of TANDEM were done by Simon Leclerc.